Satin Rouge, Raja Amari’s first film, tells the story of middle-aged widow in Tunisia whose loneliness inspires her to embrace a new personality. Lilia is an attractive middle-aged woman that has recently been widowed. Following the loss of her husband, she feels alienated by her daughter, Salma, who has developed teenage interests and keeps busy with friends and schoolwork. Lilia is consumed by loneliness and boredom, which causes her manically transition between compulsively cleaning her home sometime times, then lazing by the television for the remainder of the time. During this time, Lilia begins to worry about Salma while she is gone, and suspects she has begun to date an older man. Lilia follows her daughter after her dance class one night and sees her with Chokri, a musician that performs at a nightclub. When Lilia goes to the club one evening to confront Chokri, she immediately feels uncomfortable because of seductive belly dancers and rowdy crowd in the cabaret. After acclimating, however, she becomes attracted to the carefree and depraved nature of the customers and employees. After becoming friends with one of the belly dancers, Lilia is captivated and wants to learn to perform. When Lilia improves, she becomes a dancer at the nightclub she had gone to at the beginning of the film. Given her newfound lack of inhibition, Lilia opens herself to a romance with Chokri. Lilia’s journey of self-discovery is signified as she transitions from a modestly dressed, lonely widow, to an uninhibited, sensual bachelorette. Holden, Stephen. 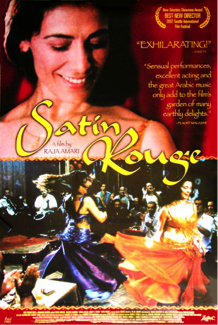 "Satin Rouge (2002) Film Review; Belly Dancing as Solace For a Demure Arab Widow." The New York Times. 23 Aug. 2002. Schultz, Kate. "Self-Empowerment by Way of the Midriff; Raja Amari's "Satin Rouge"" Indiewire. 20 Aug. 2002. Brussat, Frederic, and Mary Ann Brussat. "Satin Rouge." Spirituality & Practice. 2015. Chin, Daryl, and Larry Qualls. “Try to Remember: Cinematic Year in Review 2002”. PAJ: A Journal of Performance and Art 25.2 (2003): 48–64. Web. Jensen, Jytte. “Mapping Subjectivity.” MoMA. 21 Nov. 2012. Web. 21 Nov. 2015. West, Joan M. The French Review 76.6 (2003): 1282–1284. Web.